You Can Now Detect Termites in Your Home Yourself! 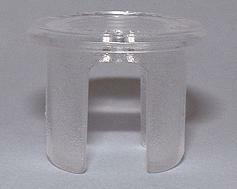 Is this simple package the best internal termite monitoring system in the world? We reckon it is, so read on and draw your own conclusions. If termites were active and undetected in your home right now, would you like a simple, immediate and likely way to discover them? Would you like to know if there is any previously unrepaired termite damage in your home? Would you like a neat and tidy way to check for termites inside the structural timber of your walls and floor boards? Would you like a neat and tidy way to check for termites inside the timber trims such as skirting boards, door frames, window frames and other decorative timber around your home? If you are fairly handy around your home with a few tools, would you like to be able to install it yourself for under $100? Would you prefer a professional pest control technician to completely install it for you instead? From $495 for up to 100 Ec2c windows fully installed, it might be the best investment you’ll make in your home this year. If you answered yes to any of the above questions, then let us show you more about our simple but clever internal termite monitor; ‘The Ec2c Termite Window®’. 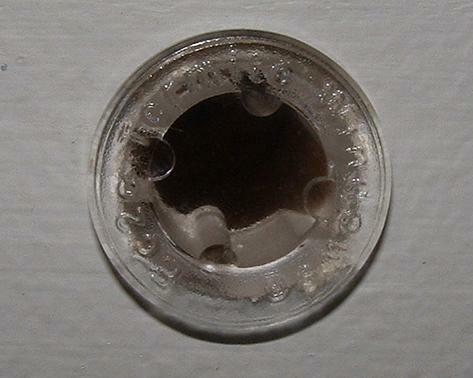 This tiny Ec2c Termite Window is a world first and totally unique in its design. It actually allows you to see into walls! Not just into the walls, but into the timber inside your walls. It’s has special grooves that allow it to be aligned with the grain of the timber, making it easier for termite activity to be sighted in the lens. 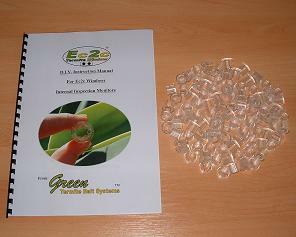 The Ec2c Termite Windows are made from super-tough polycarbonate and will last a very long time. They are both simple and effective. It’s UNIQUE design allows inspection where others fail. Until now, it’s been virtually impossible for anyone, including professionals, to easily check whether termites are hidden in the framework of your home. Investigation usually involves cutting big holes into the walls to take a closer look. Even then, the termites can remain hidden. Fact: Infrared cameras, moisture meters and other electronic termite detection devices used by professionals can still fail to locate active termites even though termites are right there chewing through the timber. Ec2c Termite Windows take away the guesswork. They allow you to see right into the timber under question. Ec2c Windows are specially slotted. 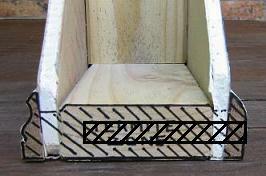 Each Ec2c Termite Window is specially slotted to allow termites to access the window even in timber as thin as 15mm. The slot is simply aligned with the grain of the timber as the window is pushed into position. They are constructed from very tough clear polycarbonate and will last a lifetime indoors and many years outdoors. If they do need replacing it’s a simple matter of using a screwdriver to remove the old window, then simply push in a new one. Should you discover termites behind the Ec2c Termite Window, it’s possible to remove the window and have your professional pest controller use the pre-existing hole to apply a registered termiticide. Once installed they last a lifetime inside your home and remain a permanent part of your termite inspection program. They can be easily checked in just a few seconds anytime you are passing by. This is how a colony of termites sees your home. They see only a meal, a pile of dead timber; their means of survival. 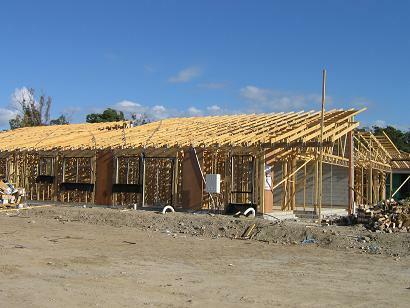 The roof is supported by the timber frame, not by the outside brickwork which is only cladding. Termites can eat their way up to the roof via the vertical timbers in the walls called studs. Termites usually use the baseplates to travel around your home.Fact: Termites predominantly travel through your home in two ways. Sometimes they build mud trails on the surface of the timber while they explore and size your home up for invasion, or whilst searching for a more desirable timber such as the softwood found in your skirting boards and architraves and around windows and doors. Usually they travel from one room to another as they eat their way undetected through the middle of the timber that makes up the frame of the house. 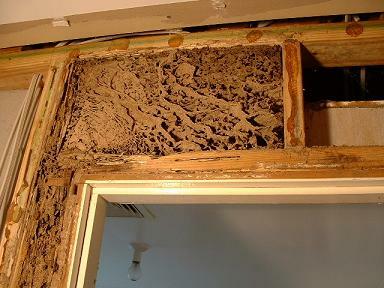 Fact: These termites would have been detected much earlier if Ec2c Windows had been installed throughout the house. Fact: By the time you discover termites are in your home, it’s usually too late. Hence, if you are unlucky enough to get termites, the sooner you discover them the better. Termites can be very well hidden. First of all, they are usually hidden inside the walls of your home. 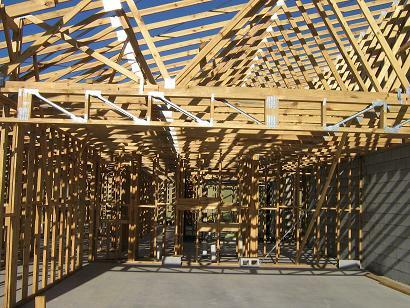 Second, even if you do open up the walls to look for them, they may remain hidden inside the timber framework. The timber may look and feel perfectly sound, yet still have termites in it. Even professionals can be fooled. Their very survival depends on complete concealment. A house can look perfectly sound, yet it can be steadily gutted by termites and most of the time you won’t even know it. Unfortunately, many people discover they have termites too late… when the damage is already done! Termite treatments are usually costly and additional repairs can be very expensive. Fact: Many termite reports FAIL to detect all past or present termite activity. Fact: The early detection of termites in a home is extremely hard to achieve, even for highly experienced professional termite inspectors using the very latest electronic equipment. Why consider installing Ec2c Termite Windows®? The early alert of termites in your house gives you extra safety. If you do decide to install a set of Ec2c Termite Windows and they help you to discover termites inside your home at an early stage, won’t it be worth it? You bet! None of us ever want to see if the airbags work in our car, but it’s reassuring to have them. Similarly, we hope that you will never find termites in your home, but if you do, and your Ec2c Termite Windows help you to spot them early on; you’ll be very glad you had them installed. Any reasonably competent handyman can install these windows. If you can work a electric drill, then you can do it! Indeed, it is very easy – but it does take some time and some careful planning – all of which is clearly explained in the installation manual. Alternatively, contact our distributors (see the link at top of every page) for a full install from just $495. This normally takes about 2 – 4 hours. Then press in an Ec2c Termite Window. Done! Full directions, hints and tips are provided in the D.I.Y. installation manual. They are so easy to check you can do it anytime you are passing by. This is what you hope to see – a nice clear Ec2c Termite Window. The Ec2c Termite Windows work by using the natural behavioural instincts termites to reveal their activity to you. If termites have ventured into your home you will most likely discover them once they reach the point INSIDE the timber where the Ec2c Termite Window is installed. They don’t like the light so they will mud over the inside of the window just like they do on our external termite baits! This image is greatly enlarged so you can see how the window appears when termites are present. The Ec2c Termite Window gives you a way to see into their concealed world inside your walls. Where can termites hide and travel in your house? If you conduct a little research on the internet you will note that there are very few ways to check for termites inside your home yourself. Some over-complicated D.I.Y. products are available for monitoring termite activity within the walls of your home, but the problem is, for a variety of reasons, they simply don’t work. One obvious reason why most internal termite monitors don’t work is because they sit on top of the timber baseplate in your walls, which isn’t a logical place to locate them because termites are likely to totally miss these devices. Why? 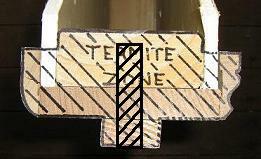 Simply because termites usually travel through the baseplate, not on it. To repeat; termites are usually hidden in the timber that makes up the frame of most homes. This is a section of a baseplate and skirting boards. The Ec2c Termite Window allows you to check for termites in both the baseplate and the skirting board. The Ec2c Termite Window can reveal if termites are hidden deep inside the walls. 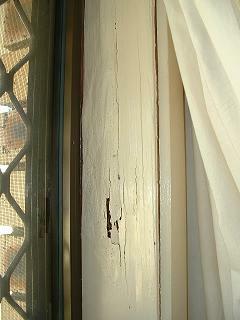 Obviously it’s imperative that the windows are installed where the termites are most likely to hide! The windows can be installed on any flat surface such as a wall where there is a stud behind it, or a window frame, door frame, a skirting board, floor boards or… you name it. Ec2c Windows are very versatile. In fact they have dozens of uses outdoors as well! Click here to see outdoor uses. If you are imagining a bunch of ugly holes in your walls and thinking to yourself – “no way chum,” then slow up for a minute and we’ll explain further. They are very neat and tidy when in plain sight. However, most of the time the Ec2c Termite Windows will be invisible! Why? Simply because they are mostly installed in places within your home that are normally concealed from a casual glance. They will be placed inside built-in wardrobes, behind doors, furniture, curtains, etc. In most cases you will need to know where to look, before you will actually spot them! Even with Ec2c Termite Windows installed in every room of your home, few guests will ever spot them, even though they are right under their noses. They can also be camouflaged with a removable sticker and colour matched for enhanced concealment, though few people feel this is necessary. 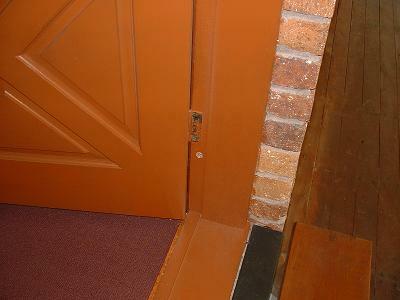 If you look carefully you can see the Ec2c Termite Window under the door hinge. It’s simply smart to install Ec2c Termite Windows. They are an innovative and useful addition to your regular home termite security and provide much needed ongoing peace of mind about the safety of your home. In fact, they are essential if you want a better chance to detect termites in your home early. They could very well save you a lot of money and anguish later on. Help to alert you to any current occurrence of active termites in your home. Hidden termite activity may be revealed during the installation process when the drill penetrates through apparently normal timber into concealed timber that is active with termites. Assist in alerting you to previous termite damage in areas of your home that have yet to be repaired. These old areas of termite activity may also be revealed during the installation process in the same way as mentioned above. Help to alert you to new termite arrivals in your home in the future. Prove to be an invaluable tool when it comes to inspecting your home for termites, either for yourself or your professional termite inspector. Enhance the value of your home when it comes time to sell, because they will remove a great deal of the doubt that creeps into the standard pre-purchase report – helping to overcome broad-stroke generalisations commonly worded in reports such as “no inspection was made of internal walls, so no opinion can be made” and “a more invasive inspection should be / may be needed (at extra cost)” and so on. 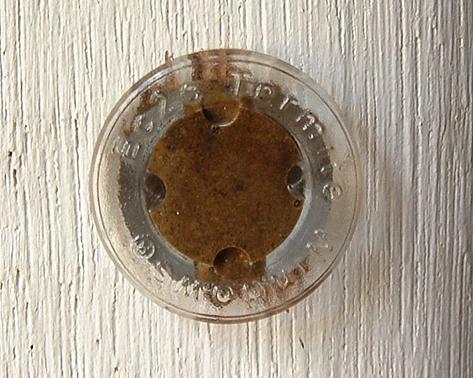 You can check your Ec2c Termite Windows in just a few minutes any time you want. It’s easy. There are no moving parts, so there is nothing to break and nothing to go wrong. They are permanent and will last for the life of the home. If active termites are discovered, then the termites can be treated with a registered termiticide by your professional termite manager far more easily. The average handyman can install these Ec2c Termite Windows in a few hours by following the simple instructions provided with our D.I.Y. kit which also contains: Pack contains 100 Ec2c Termite Windows. Enough windows for 1 or 2 homes – why not go halves with a neighbour or family member? A comprehensive instruction manual including tips for installation and selecting the most effective window locations. They can also be installed externally on fence posts, house piers, retaining walls, pergola posts, live trees, stumps, sub-floor bearers, power poles, etc. In fact, the Ec2c Termite Windows can usually be installed with ease onto ANY timber surface that is considered at risk of termite damage. Examples here. Should you discover termites behind the Ec2c Termite Window, it’s possible to remove the window and have your professional pest controller use the pre-existing home to apply a registered termiticide. If you want to know at a glance if termites are inside a wall, baseplate, stud or any other timber structure in or out of your home, then the handy Ec2c Termite Windows are the answer you’re looking for. Their versatility is only limited by your imagination! It only takes a few minutes to install each one. An electric drill with a 13mm drill bit for plaster insertions, and 13.5mm drill bit for timber insertions. (Drill bits are available from us on our order page). 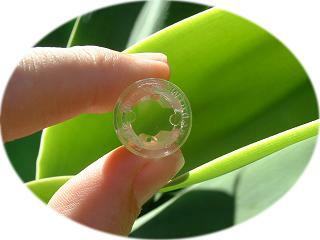 No glue is needed; they press in firmly and are child-proof. This unique little window is simple, and our package is truly great value for money. It’s not just about the windows, it’s the information and instructions that come with it that make it such a great value package. Ec2c Termite Windows are not intended to replace your regular professional termite inspection and report. If you do decide to purchase a set of Ec2c Termite Windows and follow the directions within, they should help you to discover termites inside your home earlier than if you waited for your regular termite inspection. However some people will be more thorough than others and many other variables may also affect whether you are successful at finding active termites or not. The early alert of termites in your house gives you extra safety and could save you money on repair bills. Used as directed, the Ec2c Termite Windows will complement your existing termite management strategy and help to reduce the risk of termites damaging your home. Termite Windows Notice: The Ec2c Termite Windows® can be an extremely reliable means of detecting termites that have entered a building, however due to a range of factors beyond our control, we do not claim or promise 100% results. Ec2c Termite Windows® should not be relied upon as a sole means of termite detection. 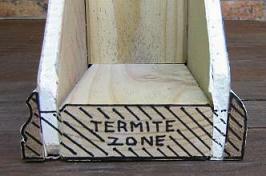 The Australian Standards advise at least annual inspections by a licenced termite inspector. Question: Did you know that the Ec2c Termite Windows should improve the value your home when you decide to sell it? It’s a big plus in your favour if you have been pro-active in reducing the termite activity around your home. 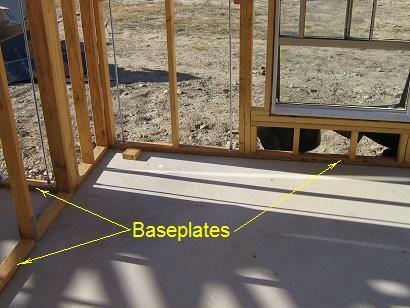 The installation manual includes a termite window location page which you can present to potential buyers or their pre-purchase inspector to assist them. It’s a feature that will give your home a competitive edge. Fact: Many pre-purchase termite inspections have a written clause that states ‘no inspection of internal timbers was made, or can be made – “no opinion is offered etc. blah blah blah” AND “A more invasive inspection is available at extra cost”. Your Ec2c Termite Windows will aid and assist any reasonable pre-purchase termite inspector. They not only improve the value of your home when you decide to sell, but they may well save you from expensive termite damage in the present. There is simply no need to be a victim of termite attack. Logical inexpensive steps can be taken to greatly reduce your risk. In a nutshell you need to do three things. Install and maintain a Green Termite Bait System or some other effective means of reducing the risk of termites getting into your home. Install an Ec2c Termite Windows System throughout your home and check them regularly. Have your home inspected by a trusted professional at least once a year and follow their advice. If you want to spend the least amount of money for the most amount of effect, then don’t procrastinate. Termites depend on human apathy. You can beat termites. You can win. Now you know what you should be doing. It’s up to you to do it. You can order online from our secure order form. Just select the Ec2c Termite Windows box and fill out your details. For immediate delivery simply ring us on 1800 6 12345 and place your order. Would you prefer full service? Want to sit back and let a professional do it all for you? Contact one of our distributors and make a booking with a licenced technician to come and install the Ec2c Termite Windows for you. From only $495 for up to 100 fully installed… Too easy!